The reality is that many employers commit wage theft with impunity. Increasing the consequences of wage theft for employers, improving the remedies available to workers, and strengthening wage theft enforcement tools are core strategies to realizing economic justice and respecting workers’ dignity. Over the last decade, workers, advocates, and community leaders have developed a variety of strategies to combat wage theft in cities and states across the country. Campaigns have organized direct actions against employers and industries, fought for stronger legal protections at the state and local level, and advocated to improve enforcement of existing laws. Successful legislative campaigns have included, among other improvements: stricter penalties for violations, stronger protections from employer retaliation, and increased funding for enforcement. 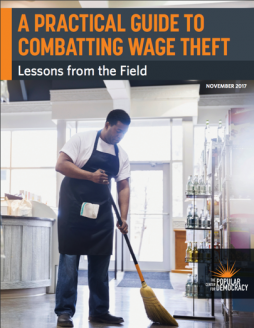 This guide gathers lessons from successful campaigns, as well as sample materials from leading advocates in the field, to support the growing network of organizations working to combat wage theft and strengthen laws that protect workers from abuse. This guide is intended to be a point of entry for organizers and organizations that are planning to launch a wage theft campaign, as well as a resource for established campaigns or coalitions. Due to the contextualized nature of campaign planning, much of the content is presented in general terms. We encourage you to contact the Center for Popular Democracy, as well as organizations referenced throughout this guide, for technical advice and support as you build your wage theft coalition and campaign.